Article by Mary Straus published in the Whole Dog Journal, April 2007. For many years, I fed my dogs the finest kibble diets I could find and thought I was doing the best I could for them. Then, in 1997, a seminar at Wolf Park in Indiana changed my life, and my dogs’ lives. Watching wolves tear into a whole deer carcass, I was struck by how far we have come from the natural diet that our dogs evolved to eat, and it started me thinking that maybe there was a better way. After a year of research, I began feeding my dogs a homemade raw diet in December 1998. At the time, I had two dogs who suffered from environmental allergies, and one dog (Piglet) on Rimadyl for arthritis. To my surprise, within three months one of my dogs became completely allergy-free, and Piglet no longer needed Rimadyl for arthritis pain. The third dog improved, but continued to have some problems with allergies. Not every dog with health problems gets better when switched to a homemade diet, but throughout the years, I’ve heard many first-hand accounts of dogs with serious conditions who improved or even completely recovered following such a diet change. People whose dogs suffered from seizures, IBD and other digestive disorders, allergies (both food and environmental), skin problems, chronic ear infections, arthritis, and more have seen their dogs’ symptoms reduced or eliminated after they began feeding a homemade diet. At first, it seems counterintuitive that a diet change would affect disorders like environmental allergies, seizures or arthritis, but there are several factors involved. Poor-quality and overprocessed ingredients, artificial colors and preservatives, hormones, antibiotics, and other chemicals can contribute to overall ill-health and create or increase allergic sensitivity. Carbohydrates that are often 50 percent or more of dry dog foods are harder to digest than animal proteins and can lead to inflammation in the body. In contrast, homemade diets, particularly those that have few or no grains or starchy carbs, are higher in protein (which supports both the skin and the immune system), and are easier to digest (which can improve the health of the digestive tract and keep the body’s immune system from becoming overreactive). Grains and other carbohydrates may cause problems due to allergic reactions, gluten intolerance, difficulty digesting carbs, or other factors. If your dog is overweight or suffers from any of the ailments listed above, you may want to try feeding a homemade diet without grains or starchy carbs to see if your dog improves. Healthy dogs also benefit from a homemade diet. Fresh foods supply nutrients in their natural form, whole and complete. Processing causes foods to lose much of their nutritional value, which must then be added back in synthetic form (that long list of chemicals at the end of dog food ingredient lists). Processed foods can also contain potentially harmful substances, such as oxidized fats and acrylamide, a carcinogen formed when high-carbohydrate foods are cooked at high temperatures. When you prepare your dog’s food yourself, you control all of the ingredients, making it easy to avoid any foods your dog may react to, and to adjust the diet as needed based on weight, activity level, health conditions, and any other specific needs your dog may have. There are many different types of homemade diets, including raw and cooked diets, with or without grains; diets that contain whole, raw, meaty bones or ground raw bone; diets without bone that use a different form of calcium supplement; and diets that add fresh raw or cooked foods to a commercial pre-mix. While feeding a homemade diet sounds like a good idea, it’s not easy to figure out what that entails, or how to ensure that you provide all the nutrition that your dog needs. Despite what some will try to tell you, there is no one “right” way to feed your dogs. Each dog is an individual, and what works for one may not work for another. The best way to feed your dog may also depend on how much time and effort you are able to devote to putting together a proper diet. While fresh foods are healthier than processed foods, a good commercial diet is better than a poorly designed homemade diet. If you don’t feel comfortable preparing a diet yourself, you can still improve the diet you feed by adding fresh foods. You can consider this article and those that follow in the coming months as a “short course” on preparing your dog’s food yourself, but we also suggest that anyone who wants to feed their dogs a homemade diet read at least one book (preferably more) on the subject before beginning, in order to have a better understanding of your dog’s nutritional needs and how they are met by the foods we provide. One thing we will not do is provide specific recipes you to follow. It is exceedingly difficult to ensure that your dog gets all the nutrients he needs if you feed the same food all the time. Even following a diet that has been evaluated using a spreadsheet and compared to the AAFCO (Association of American Feed Control Officials) or NRC (National Research Council) standards does not ensure the diet will be nutritionally complete, for several reasons. Just as with our own diets, what’s considered “good,” “optimal,” or even “essential” is continually changing. The nutritional levels established by AAFCO are based on older guidelines published by the NRC in 1985, and have not been updated following the release of newer NRC standards in 2006. A good example of how these standards can change is the discovery in 1987 that cats were dying of heart failure due to a lack of adequate taurine in cat food. Previously, the NRC did not recognize taurine as an essential nutrient for cats, and no one knew how much cats required. Now, newer research shows that taurine may also be conditionally essential in the dog’s diet, though there are as yet no standards requiring it. Ongoing research reveals more all the time, but this is an endless task. There is simply no way to know for certain exactly what nutrients, in what combinations, our dogs need for optimal health. In 1985, the NRC warned in its introduction to Nutrient Requirements of Dogs that “caution is advised in the use of these requirements without demonstration of nutrient availability, because in some cases requirements have been established on the basis of studies in which nutrients were supplied by highly purified ingredients where digestibility and availability were not compromised by the interaction of dietary constituents and effects of processing. Practical diets formulated from commonly used ingredients are not free of such interactions and effects, and therefore may provide less available nutrients than the amounts measured by chemical analysis. “For this reason, such diets formulated to the chemically assayed nutrient levels expressed in Table 2 [Required Minimum Concentrations of Available Nutrients in Dog Food Formulated for Growth] may prove inadequate in meeting the nutritional needs of dogs.” (our emphasis). In addition to not knowing for certain what dogs require, we also cannot know exactly what nutrients are contained in the foods we feed. A spreadsheet analysis of a diet, even if done by a veterinary nutritionist, does not guarantee that the diet actually supplies exactly those levels of nutrients. The figures in the USDA Nutrient Database that are used to determine nutritional value are averages. The source and handling of foods can have a considerable impact on their nutritional value, based on such factors as whether livestock are fed grains or grass, whether the plants fed to them were grown in soil that was depleted of minerals, how fresh the food is, and whether or not it was frozen. Many recipes, including those recommended by veterinarians and nutritionists, make no effort to be nutritionally complete and simply tell you to add a “complete and balanced vitamin/mineral supplement,” with no further guidance. Since supplements vary widely, there is no way of knowing whether this would even come close to meeting your dog’s needs. We simply cannot know enough about nutrition to say with certainty that any single recipe is sufficient to meet all nutritional requirements. Feeding your dog the same recipe every day is equivalent to feeding your child a diet of nothing but Total cereal. If it doesn’t make sense for a child, why would it make sense for our dogs? Just as with our own diets, the best way to ensure that our dogs receive all the nutrients they need is to feed a wide variety of fresh, healthy foods in appropriate proportions. Variety is important no matter what type of diet you feed. Even if you use commercial foods, it is best to find at least two or three different brands, using different protein sources, and rotate between them, anywhere from daily to every few months. Also, even “complete and balanced” diets may contain quite different levels of nutrients. If you always feed the same food, any nutritional deficiencies or excesses present in that food will affect your dog over time. The same is true if you feed different varieties made by the same company, since they tend to use the same vitamin/mineral formulations in all of their foods. Your dog is also more likely to develop food allergies if fed the same food all the time. It takes time for an allergy to develop, typically months to years. Dogs that are fed the same food for extended periods of time will often develop allergies to one or more of the ingredients in that food. Variety is particularly important for puppies, since puppyhood is when the immune system learns which foods are normal and not a cause for reaction. The only restriction to consider in terms of feeding lots of variety is to reserve at least some of the exotic proteins in case a novel protein is needed to test for or treat food allergies. There’s no need to feed venison, duck, rabbit, ostrich, buffalo, kangaroo and beaver to your dog. Save some of them in case they are needed in the future. Variety means feeding lots of different foods, such as beef, lamb, chicken, turkey, pork, fish, eggs and dairy. Vegetables, fruits and grains can also be added in limited quantities. Variety also means feeding different parts, such as muscle meat, heart, liver and other organs. Different types of meat and different cuts of meat all have different nutrient profiles, so you provide a wider nutritional range by varying what you feed. It's fine to have a few staples but you should not feed just one or two foods to the exclusion of everything else. Balance over time: When you feed a homemade diet, it is not necessary that every meal be “complete and balanced,” as the commercial dog foods are. Just as with our own diets, it’s only important that the diet be balanced over time, with nutritional needs being met over a period of days to weeks. It is only when you feed the same food every day that you need to be concerned about that food alone supplying everything that your dog needs. It is imperative that all homemade diets provide the right amount of calcium. The bones in most raw diets will supply all the calcium needed. If you feed a diet that does not include edible bones, you will need to add specific amounts of calcium supplements. Our upcoming article on cooked and raw diets that do not include bone will provide detailed information as to how much calcium you need to add to your dog’s home-prepared diet. See “What Evil Lurks Within?” WDJ August 2000, for information about bacterial and raw diets. Also see A Review of AVMA Raw Pet Food Policy for a thoughtful review of scientific studies about raw food diets, AVMA vs Raw Food: Action Alert! for an assessment of risks of bacteria from raw diets, and E Coli Oubreak and Dog Risks, which says, "The role of E. coli O157 in disease in dogs is pretty unclear, but there's no evidence it's a significant problem. Experimentally, disease can be induced in dogs fed relatively high numbers of E. coli O157, but natural disease seems to be rare (including in dogs on beef farms where exposure is probably relatively common). I think it's reasonable to suspect that this strain of E. coli can cause disease in dogs, but it doesn't happen very often." Another question that often comes up in discussions about home-prepared canine diets has to do with the avidin in raw egg whites causing a biotin deficiency, but there is no need to worry. Egg yolks contain biotin, which balances out the avidin in the egg whites when you feed whole eggs. Cooking, however, deactivates avidin and may make egg whites more digestible, so it’s also fine to feed eggs that are soft- or hard-boiled, or lightly scrambled. What about bones? Haven’t we heard from the time we were children that you should never give chicken bones to dogs? That’s true, if you’re talking about cooked bones. Cooking makes bones hard, dry and splintery. There is no question that cooked bones are dangerous for dogs. Raw bones are much softer and more flexible, and are easily digested by most dogs. Those of us who feed our dogs a raw diet commonly feed what are called “raw meaty bones” (RMBs), parts that include edible bone along with at least half meat, and that are fully (or mostly) consumed. In addition to the nutritional value they provide, RMBs are also a source of chewing pleasure and help to keep teeth clean and gums healthy. Examples include chicken necks, backs and leg quarters, turkey necks, lamb breast and necks, and pork breast (riblets) and necks. Most dogs do fine with raw meaty bones, but a few may have problems, especially if they try to swallow large chunks. While it is unusual, dogs have been known to choke, especially when fed pieces that are round and meaty. Turkey necks are the parts that most frequently cause choking in large dogs, while chicken necks can cause the same problem in small dogs. You should always supervise your dogs while they are eating, and it’s a good idea to know how to do the Heimlich maneuver on dogs, just in case. Small dogs are also more susceptible to esophageal damage from bones. There are risks and benefits to feeding whole bones, and the decision whether or not to feed them is a personal one. Keep in mind that choking or esophageal damage can also be caused by greenies, tennis balls, rawhides, sticks, and even kibble. If you’re concerned about dangers from whole bones, you can grind the bones or cut them into bite-sized pieces. You can also cook bones to softness in a pressure cooker (the only kind of cooked bones that are safe to feed). You can still give your dogs recreational bones, ones that your dog cannot consume, for chewing pleasure and dental health. People also worry about dogs breaking teeth on bones. This is more of a concern with recreational bones, particularly those that the dog can fit between his molars and crunch down on, such as marrow bones. These weight-bearing bones are much harder than the RMBs that are consumed. Knuckle bones are less likely to cause tooth damage because dogs can't fit them into their mouths and bite down on them. Most of the RMBs that are recommended for dogs are soft, at least to a dog’s jaws. Beef bones, in contrast, are quite hard. I know of dogs, including my own, who have broken teeth on beef ribs and neck bones. Many people give these to their dogs as recreational bones but large dogs may consume them. Teeth do become more brittle with age, so you may need to exercise more caution as your dogs age. For more information about feeding bones in the diet, see “Bones of Contention,” September 2000. For information about recreational chew bones, see “Dem Bones,” August 2003. Lastly, there is no danger in feeding a high-protein diet to puppies or senior dogs (see “Diet and the Older Dog”, December 2006). Studies have proved that high protein does not cause orthopedic problems in puppies, nor kidney disease in older dogs. Protein is highly beneficial; it supports the immune system and the central nervous system, contributes to healthy skin and coat and to wound healing, and helps to maintain lean body mass while lowering the percentage of body fat. Dogs fed a high-protein diet are often calmer and less hyper than dogs fed on high-carb diets. Higher protein is one of the major benefits of feeding a homemade diet to dogs, though you can also increase the protein level by adding fresh, high-protein foods to a commercial diet. For an excellent, unbiased overview of the arguments for and against feeding raw diets to dogs, see Love Me Tender ? .... Or Should My Pet Be Eating A Raw Meat Diet? by Ron Hines, DVM, PhD. If you are not ready to make the switch to a homemade diet, you can still improve your dog’s diet by adding fresh foods to his dry or canned food. Despite the warnings from pet food manufacturers, you will not unbalance the diet by adding a moderate percentage of fresh foods – you should be able to replace about 25 percent of the diet with fresh foods without concern. When you start to feed more than that, it becomes more important to feed variety and proper proportions. If you want to feed 50 percent or more as fresh food, then you should add organs along with other foods, and you should consider adding calcium if you are not feeding bones. The more fresh food you feed, the greater the importance of variety and proportions, as well as calcium, becomes. More information will be provided in future articles. Good foods to add to a commercial diet include eggs and meat (raw or cooked), canned fish with bones (jack mackerel, salmon, sardines), yogurt or kefir, cottage cheese, and healthy leftovers. Raw meaty bones can also be fed, though it’s best if they’re not combined with kibble in the same meal. You can add veggies and fruit in small amounts, but remember that commercial foods are already high in carbohydrates, so there is little benefit in adding more. I would not recommend adding grains to a commercial diet at all. Puppies and seniors will benefit from the addition of high-quality fresh foods as much or more than younger adult dogs will. A high protein is good for almost all dogs and will not cause harm. Sammy is a 9-year-old Golden Retriever with epilepsy belonging to Dale Martin of Hamilton, Ontario. “Sammy is one of those dogs who essentially stopped seizing after starting first a home-cooked, then a raw diet with no grains,” says Martin. “Sam had been seizing about once every two months even with anti-epilepsy drugs until the diet change. Since switching to raw, we have taken Sam off all medications, and she’s had only two seizures in over five years.” Martin has since adopted and fostered several other epileptic dogs, and has seen seizure frequency and intensity decrease in most of them when switched to a raw diet. Even though dogs are not obligate carnivores as cats are, they still require nutrients that can be derived only from animal sources. While it may be possible to feed a vegetarian diet with appropriate supplements, it is not optimal, and it is extremely difficult to ensure that all nutritional needs are met. Dogs are sometimes called “opportunistic omnivores” due to the fact that they can survive on a wide variety of foods, but they are designed by nature to eat a diet primarily from animal sources. Their teeth and jaws are made to rip and tear off chunks of meat, not to chew and grind plant foods; their saliva does not contain digestive enzymes; and they have the carnivore’s shorter and smoother intestines designed to process proteins and fat, not the longer, pouched digestive tract needed to digest carbohydrates. A survey of 300 dogs fed a vegetarian diet found a number of health problems, including several deaths. Some of these problems increased the longer the dogs were fed a vegetarian diet. Heart disease, especially dilated cardiomyopathy, is just one of the conditions that can be caused by the nutritional deficiencies of a vegetarian diet. Another study found that "dogs fed plant-based soy protein experienced far more musculoskeletal injuries than dogs consuming meat protein" (quote from veterinary nutritionist Dr. Joseph Wakshlag, Feeding Your Canine Athlete). Even commercial vegetarian diets are not guaranteed to meet your dog’s nutritional needs. Remember that taurine has not yet been classified as essential in the dog’s diet, despite newer research showing that dogs develop heart disease when fed diets containing inadequate amounts of this amino acid, which is found only in meat. While your dog may appear to be healthy when fed a vegetarian diet, you will never know about the damage being done to his heart, or other potential problems, until it is too late. 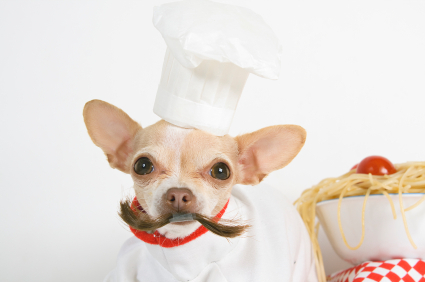 There are a number of dog food pre-mixes on the market that are designed to be added to meat, eggs and other healthy foods to create a complete diet (see “Mixing It Up,” July 2004). Others are nutritionally "complete and balanced" alone, but are formulated to permit the inclusion of fresh foods. Super-premium examples of the latter are The Honest Kitchen's dehydrated diets, several of which are grain-free. Though these diets are complete (except for one variety, Preference), The Honest Kitchen recommends (and offers detailed directions for) mixing ½ to 1 cup of fresh food to each cup of rehydrated mix. Available from Amazon. Solid Gold’s Holistique Blendz "was created to be used as the nutritionally balanced base, to which additional raw (or cooked) meat, vegetables, Buckaroo Beef [the company's freeze-dried beef patties] or canned food can be added." Other companies who offer pre-mixes include Timberwolf Organic’s Black Forest Canid Formula, Urban Wolf (grain-free), West Coast Canine Life, Sojourner Farms (offers a grain-free variety), and Wendy Volhard’s NDF (Natural Diet Foundation) that “supplies the supplements and grains of her original homemade Natural Diet in a dehydrated version,” to which you add meat, yogurt and vegetables. As with every diet, variety is better than feeding the same pre-mix, or the same added foods, all the time. See Dog Food Mixes for more information. Ian Billinghurst, an Australian veterinarian, was the first to popularize diets that include raw meaty bones. While Billinghurst's books are not as simple as many of the other books on raw feeding, they're also more detailed, and the ones I refer to most often when I'm looking for specific nutritional information. The last book is the most concise and easier to follow than the first two books. A good beginner's book on raw diets. Another good beginner's book, based on the Billinghurst diet. One of the earlier books, fairly simple and easy to follow, but restrictive, as she does not believe in feeding grains, dairy products or certain supplemental foods. This is a well-referenced book on the value of feeding a homemade raw diet, but is not a "how to" book. This book is mostly a history of Dr. Lonsdale's fight with the pet food and veterinary industries over feeding a more natural diet. It is not a how-to book. New book published in December, 2009. This book is ideal for those who are concerned about homemade diets meeting NRC (National Research Council) recommendations, as all recipes are analyzed to ensure they are complete. The book provides guidelines for making your own supplement mix to go with the recipes in the book. Unlocking the Canine Ancestral Diet - Healthier Dog Food the ABC Way by Steve Brown. Brown's fascinating book, published in 2009, focuses on the various forms of fats and how a proper balance between them is needed for optimal health. It includes guidelines and sample recipes for diets that use raw meaty bones, those that use just meat without bone (either raw or cooked), and adding fresh foods to commercial diets. A complete analysis of each recipe, comparing it to NRC guidelines, is also provided. See my article on Sample Low-Fat Diets for more information on this book. Dr. Pitcairn uses raw meat in his diets, but no bones. The meat can be cooked, if preferred. His diets are heavy on grain, but you can substitute pureed or steamed vegetables in place of some or all of the grain. This book is easy to follow and contains a lot of useful information, including help for dogs with certain health problems. It's the one I like best for those who want to feed a cooked or raw diet that does not include bones. There is a new edition published in 2005. This book covers cooked diets for healthy dogs, as well as special diets for a number of medical conditions. Unfortunately, all of these diets are heavily grain based, though again, you can substitute pureed or steamed vegetables for some or all of the grains. These recipes are pretty much translating commercial foods into a homemade diet, so they are high in carbohydrates and lower in protein than I think is optimal. Dr. Strombeck also uses soy in some recipes, which can be problematic for dogs, since it provides incomplete protein. I would not recommend using his vegetarian diets, which pre-date more recent knowledge about taurine requirements and other factors that make these diets incomplete. The Pet Food Primer by Susan Wynn, DVM. A good article about the value of rotating between and adding fresh foods to commercial diets. Allergic Skin Disease by Susan Wynn, DVM. Article that discusses the connection between canine allergy and diet.